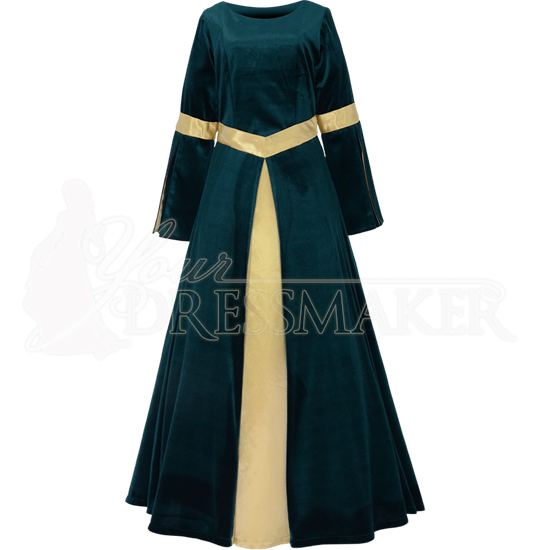 The Ladies Velvet Renaissance Gown is perfect for royalty, nobility, and all those wishing to dress with refined beauty. This royal velvet dress has satin accenting the waist, its sleeves, and set as the front accent of the long, full skirt. The neckline is rounded, and the long sleeves are slit up to the satin trimmed elbows, revealing an inner layer of satin. At the waist, a slightly angled band of satin gives flattering visual definition. The velvet of the skirt is parted at the front to reveal the satin accent panel. A hidden zipper fastens the dress at the back, and adjustable lacing over it helps achieve the perfect fit. Choose from a variety of royal velvet colors and between gold and silver for the satin accents. This full length medieval gown is offered in a range of sizes and is perfect for Renaissance fairs, medieval events, costume balls, and other special occasions.